A bright blue sky, a snow-covered landscape and an outside temperature of minus eight degrees celcius. The eSprinter stood where the temperature was considerably less comfortable, having spent the whole night in a cold cell – at 30 C degrees below zero. The difference in temperature was unpleasantly noticeable when I entered the car refrigerator, so I made a dash into the driver’s cab. There, the HVPC heater with an output of 7 kW ensured a pleasant interior temperature within a few minutes and quickly provided a clear windscreen. I was even more comfortable with the second test vehicle, which was standing in front of the cold storage halls at the Daimler test site in Arjeplog in northern Sweden. There, the electric heater provided an agreeable climate behind the wheel even before we started our journey. By using this so-called preconditioning, I could make myself more comfortable while extending the range of the front loader. This comfort function, which can be controlled via an app or the fleet manager portal, reduces energy consumption because the heater doesn’t have to be operated at a high level for a long time. Benjamin Kaehler, head of eDrive@VANs at Daimler AG, explained that I would be even more efficient on the road if I used the standard seat heater. He thought it best to encourage eSprinter drivers to do the same, because a seat heater uses far less energy for the same effect. After having made these insights, we finally head out to the extensive test area, which included various gradients and roundabouts, along with some icy sea passages. Even at these temperatures, the battery-electric van started without any problems. Under these conditions a diesel motor would have created a lot of unpleasant smoke. 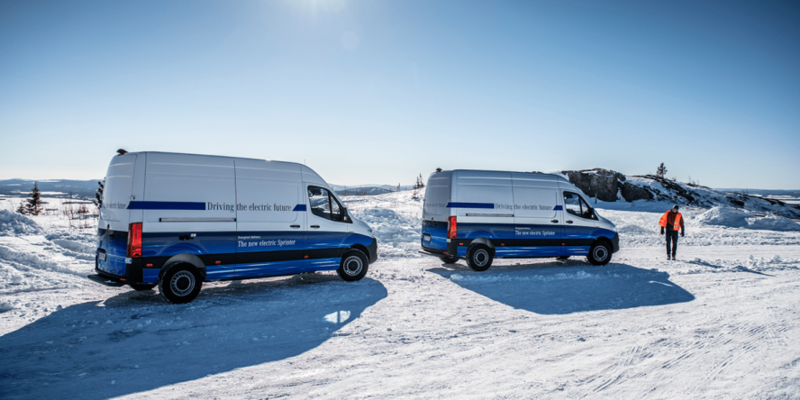 The optimisation of the starting behaviour and the thermal management during cold starts were the essential elements of the second winter eSprinter tests in March. Daimler engineers had already put the BEV through its paces for two weeks in January. In view of the icy winds that were still whipping across the snow-covered landscape of northern Sweden two months later, it was a pleasure to be there for the second press conference. 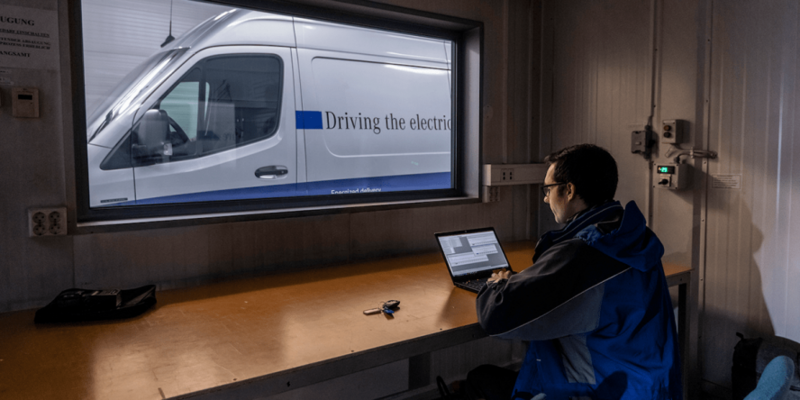 Another focus during the weeks of tests was to see the way the electric van charges in cold-temperatures. The eSprinter has a quick-charging function that enables it to recharge to around 80 per cent within 30 minutes. This must function reliably regardless of the temperature. 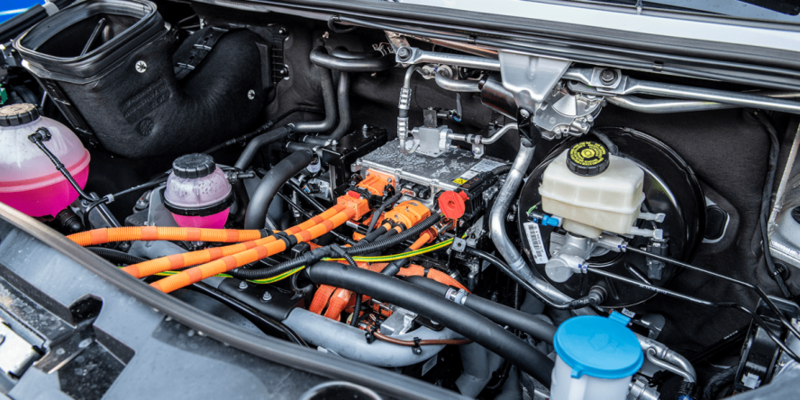 Battery management plays a key role here – because when the batteries are very cold, they are chemically unable to absorb high charging power. 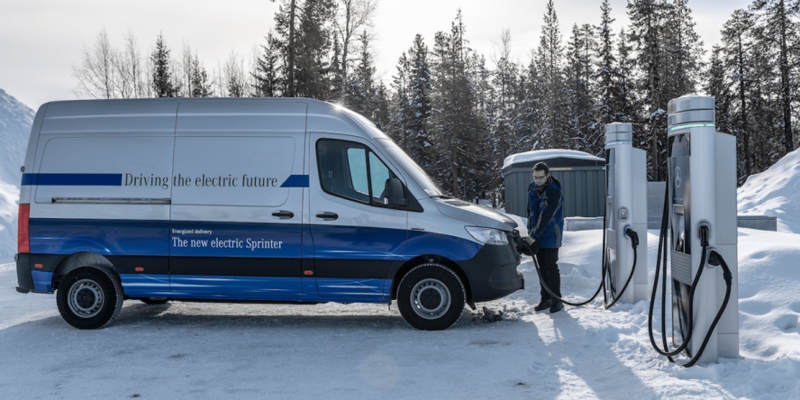 Depending on the situation, the management system then reduces the maximum possible charging capacity of the eSprinter from 80 kW to 50, 30 or 20 kW. This prevents the battery from being damaged or from ageing more quickly. There is also the option of using part of the charging power to heat the battery. This has the positive effect that the battery reaches the temperature range in which it can be charged more quickly. The other way round is also possible. If the Li-ion unit is at operating temperature, the waste heat can be used for heating purposes via heat pumps. Needless to say, the eSprinter moved silently across the test roads. The only audible sound was the quiet crunch of the snow on the roads. When cornering at high speed, the low centre of gravity of the vehicle was noticable in a good way. This is thanks to the batteries, the front-wheel drive, and the well-functioning ESP. Even during abrupt braking on polished ice surfaces, the electronic stability program made sure there were only minimal evasive movements. The coordination between the recuperation system and ESP was noticeable. The recuperation torque can be adjusted in four stages via shift paddles on the steering wheel. When the vehicle is started, the most powerful regenerative option is automatically activated. The aim is to brake as little as possible with the normal brake in stop-and-go traffic, explained Benjamin Kaehler. He assumes that the range in city traffic can be increased by 10 to 15 km with the right driving style. In general, the developers of the eSprinter have placed a strong focus on economy and longevity. Paying tribute to this was fact that the interior of the driver’s cab is reduced to the essentials, not to mention the configuration of the battery. There are two battery variants to choose from: The larger one has a capacity of 55 kWh. According to Mercedes Benz, this means a range of around 150 kilometres with a maximum payload of 900 kilograms. The second battery option with 41 kWh enables a driving distance of around 115 kilometres. On the other hand, the maximum payload increases by around 140 kilograms to a total of around 1040 kg. The difference being that four batteries are installed between the front and rear axles compared to three in the higher-range version. Proven modules have been used, since Mercedes Benz also uses the batteries in the plug-in hybrid vehicles of the S, C and E Class. According to Kaehler, owners will not only benefit from purchasing advantages, but also from higher performance. While a plug-in battery is designed to be completely drained at an average of twice a day, the eSprinter operates on a more gentle level. As a rule, the battery is discharged only once a day, and by connecting the battery blocks in parallel, only a quarter to a third of the maximum power is actually called up. “We constantly move the battery in a feel-good mode,” explains Kaehler. He expects this to increase battery life. “Our customers will enjoy it for a long time,” believes the Daimler manager. It is still difficult to say which variant will be the preferred one. Kaehler assumes that, for safety reasons, the majority of customers will initially opt for the longer range. If they then discover that the smaller battery also meets their requirements, some of the contracts for the mostly leased vehicles could be adjusted accordingly. Under conditions like those in the cold north of Sweden, the Stuttgart-based car manufacturer still promises a range of 100 kilometres. The achievement of the target also depends on the choice of the three available driving programs. The standard version “E” offers the best mix of driving comfort, range and interior comfort. The maximum drive and heating power are available under drive level “C”, and “E+” is virtually the range-optimized economy program in which drive and heating power are reduced accordingly. As an antidote to range anxiety in CEP (courier, express, parcel) operation, throttling the top speed is also an option. 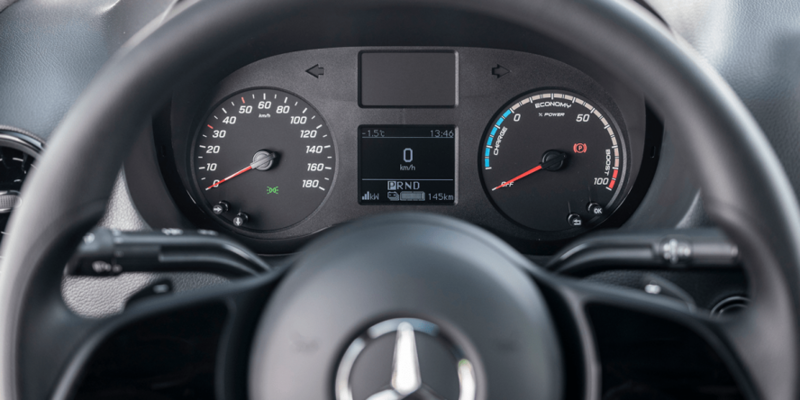 The 85 kW electric drive with a torque of up to 300 Nm can be configured to a maximum speed of 80, 100 or up to 120 km/h in any Mercedes-Benz workshop. Based on the experience gained with combustion vehicles, the head of eDrive@VANs is certain that the majority will choose the low-tempo variant. After all, reduced wear and fuel consumption are a convincing cost argument for courier services, since they often have low margins. At Hermes, eight eSprinters are currently being tested at the Stuttgart and Hamburg sites. The Daimler engineers are naturally very interested in how the vehicles are used. “No CEP driver has been left behind yet,” says Kaehler. This is not to be expected, either, as the inner-city courier service only rarely covers distances over 100 kilometres. Hermes has ordered a total of 1,500 electric delivery vehicles from Daimler. 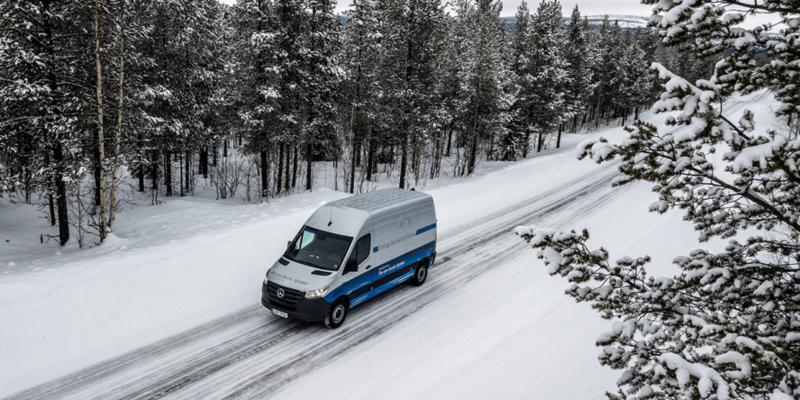 The extent to which the Hamburg company will use the eVito or eSprinter, which has been available since last autumn, is still open and, according to Kaehler, also depends on the experience gained. “We are fundamentally open here,” he says. 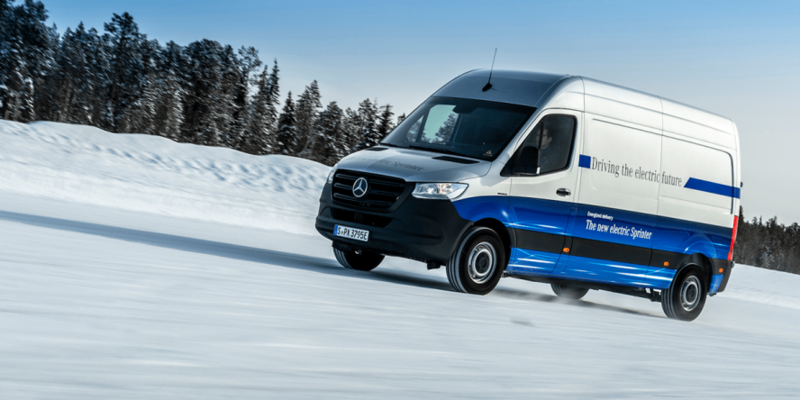 After a further summer trial in Spain, the power variant manufactured at the Düsseldorf location on the same production line as the conventional Sprinter will be sold in the second half of the year. Here, Kaehler didn’t yet want to be held down on an exact date yet. Kaehler’s assessment of the market potential was unwavering. He is convinced that “Regardless of whether cities impose driving bans or not, the future belongs to electric delivery services.” He was very encouraged by the experience of the two test weeks. 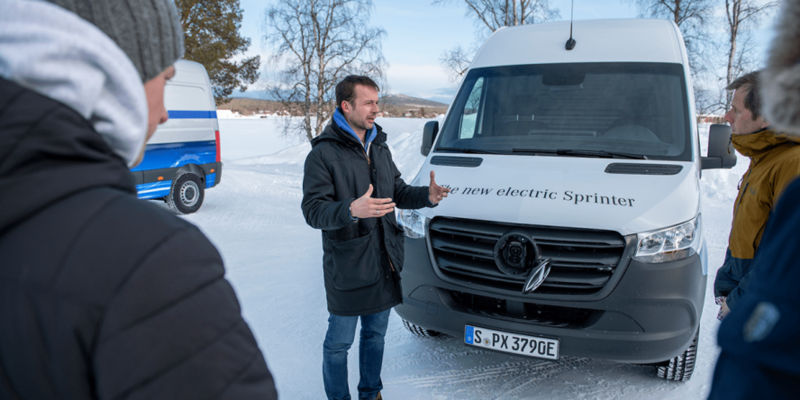 “Those travelling in colder regions wont want to miss out on the eSprinter,” he says confidently. After I left the comfort of the vehicle and stood outside again in the ice-cold north Swedish wind again, I found this forecast quite convincing.